A highly distinctive tawny-red ale; if you haven't tried this before we urge you to give it a go. 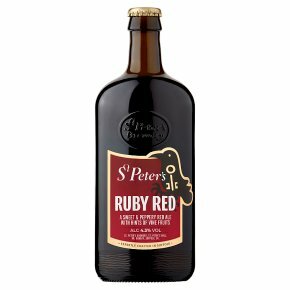 St Peter's make the finest quality traditional ales in the heart of Suffolk using the best local East Anglian malts and British hops. With subtle malt undertones, this derives its intriguingly spicy aroma from Cascade hops. A rich, red ale with subtle malt undertones and a distinctive spicy hop aroma from Styrian Goldings. Brewed with skill and patience in one of Britain's finest small breweries.